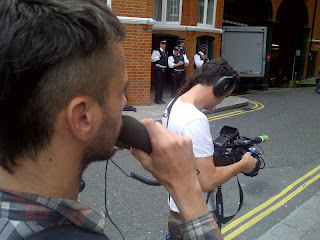 Arbolioto: BATTLE OF ECUADOR EMBASSY FOR JULIAN ASSANGE: BLOW BY BLOW. 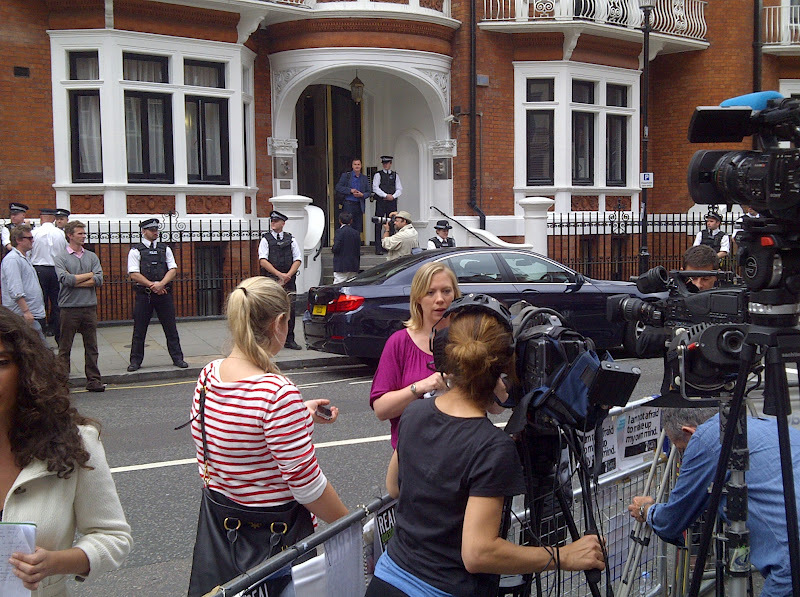 BATTLE OF ECUADOR EMBASSY FOR JULIAN ASSANGE: BLOW BY BLOW. All pictures by Arbolioto Blog unless othewise stated. Twitter timeline of a momentous day in which Ecuador caused one of the greatest world diplomatic earthquakes with London as epicenter. 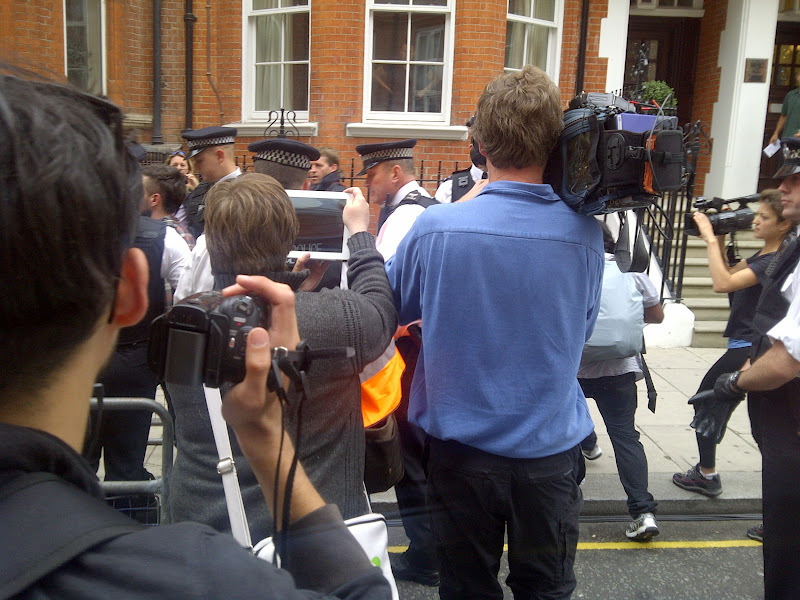 It was about the granting of asylum to Julian Assange of WikiLeaks. 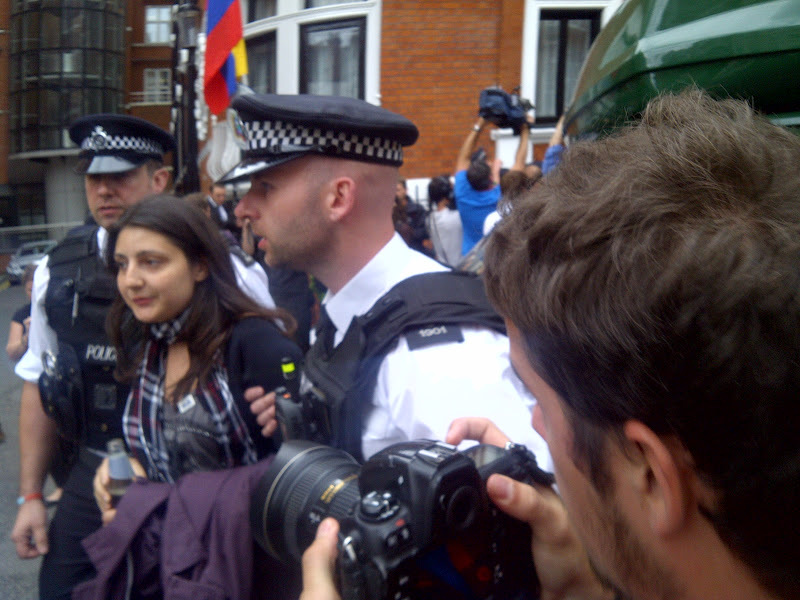 In the early hours of Thursday 16th rumours circulated in London and Quito that the UK government was preparing to storm the Ecuador Embassy in London and arrest Assange. Quickly, the Ecuador Govt made public the letter written by the British Foreign Office in which the threat to "revoke diplomatic immunity of the embassy" was made. 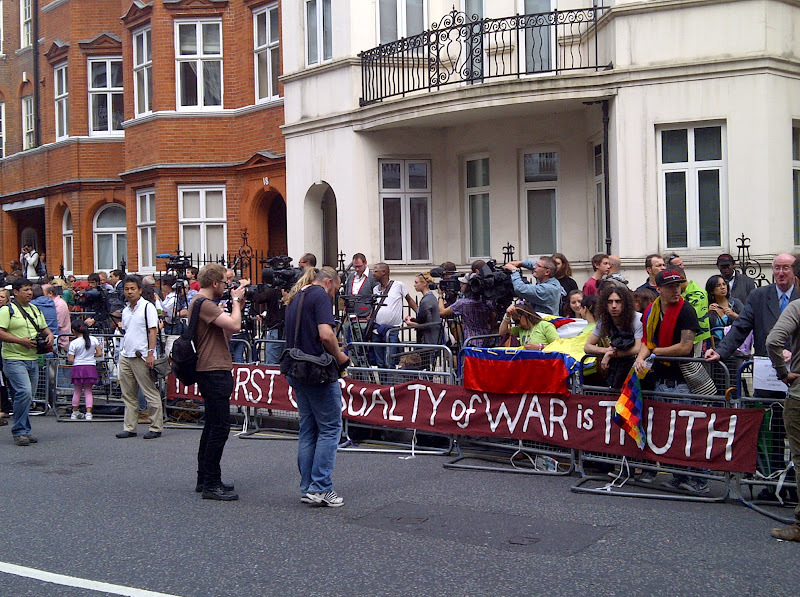 Called into action by Assange himself, a group his supporters arrived at the embassy and formed a cordon outside the Ecuador Embassy in the early hours of Thursday 16th. Thanks to world revulsion and the quick response of Assange supporters, the threat of an embassy takeover subsided by daybreak. 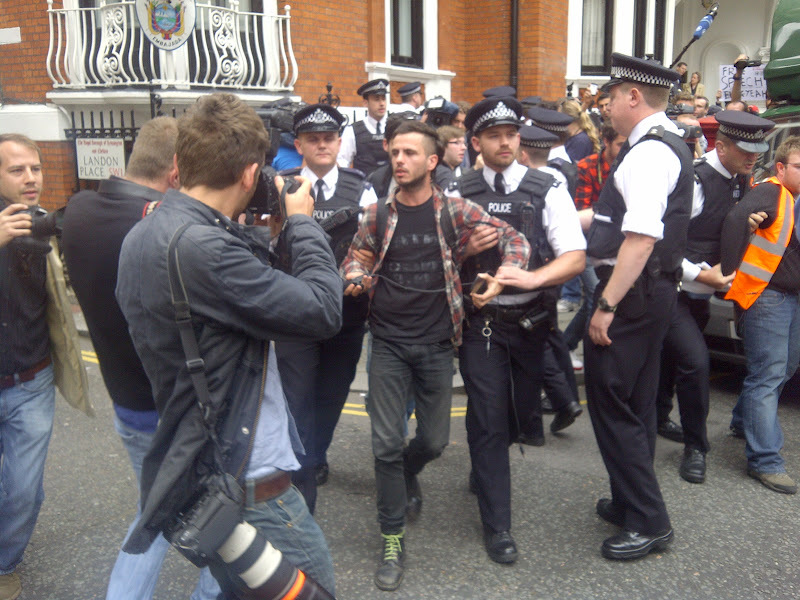 At around 10:50am UK police decided to take on and forcibly remove some 15 protesters from the pavement next to the embassy. Their violent action was captured by our photographer and can be seen on this blog. An asylum seeker wishing to get out of the country has never happened before in Great Britain. With the final asylum decision by Ecuador expected today here's a blow by blow Arbolioto Twitter transcript in real time with exclusive photos and running commentary. 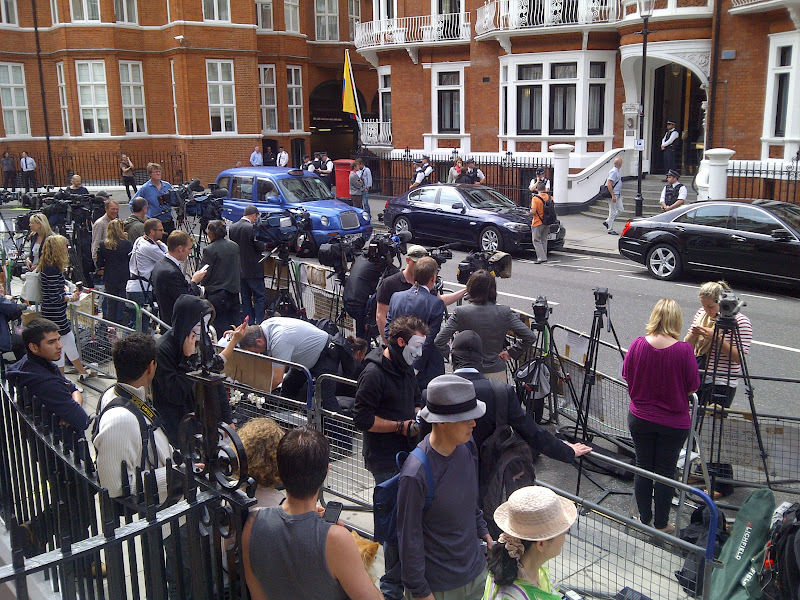 The original group of Assange supporters can be seen across the road protecting the embassy building. 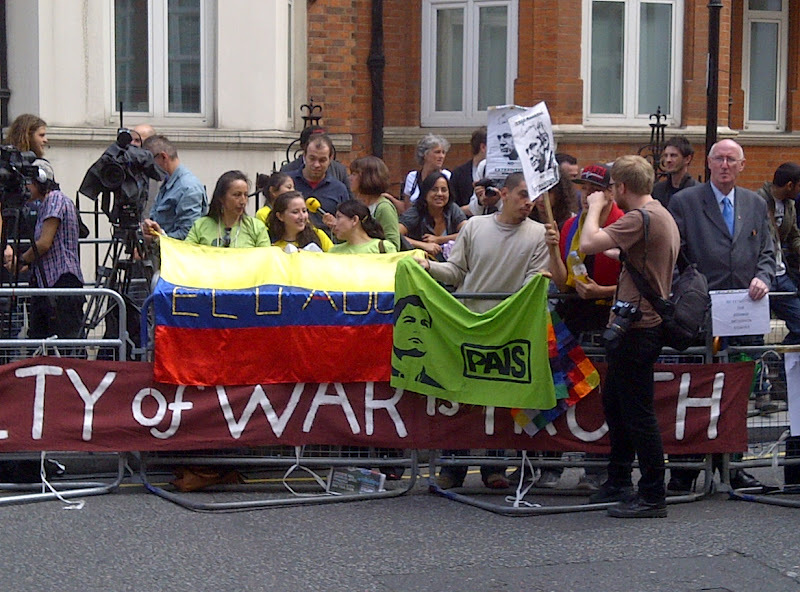 Ecuador would laid bare the possibility that Great Britain and other NATO countries may be part of a conspiracy to suppress information on the Iraq and Afghanistan wars. Only recently torture against the Libyan dissident Bel Hadj, the British national Binyam Mohammed (imprisoned in Guananamo) and detainees in Iraq during the occupation have been investigated by British justice and covered by the media. In Sweden, in 2001 terrorist suspects were secretly handed over by Swedish police to CIA agents which were then 'rendered' and taken to Mubarak's Egypt for torture. The possibility of a politicised justice system in Britain goes far back as the 1970s and 80s. There's the example of many innocent Irish nationals who were accused of perpetrating acts of terrorism and sent to jail only to be released after many years of campaigning against miscarriages of justice. In more recent times, British justice took ten years to formally investigate allegations of political and celebrity phone-hacking by Rupert Murdoch's The News of the World and The Sun newspapers. The Scotland Yard officer in charge of that investigation, John Yates, who had to resign from his post due to his inaction, is now a security advisor to the dictatorship of Bahrain. 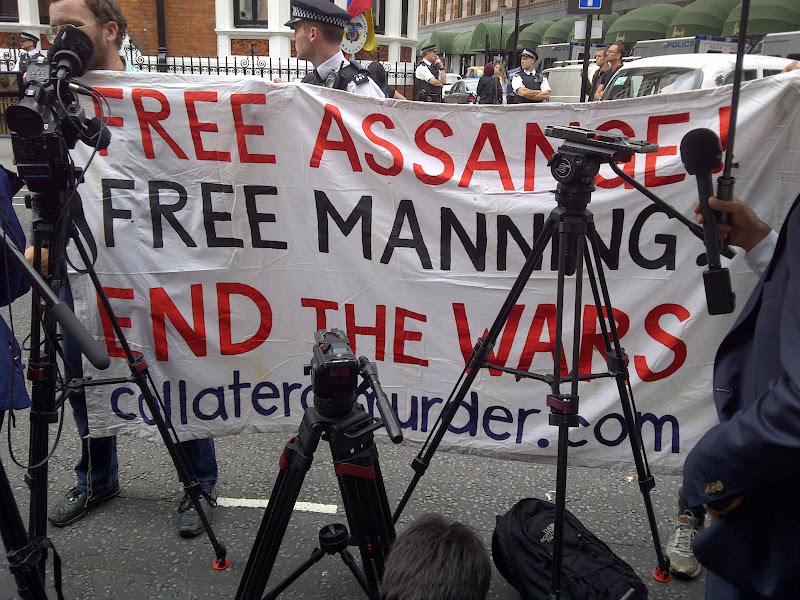 All points towards the serious possibility that government pressure has politicised the criminal justice system in Great Britain, Sweden and the United States, a fact that will be taken into account by Ecuador when deciding the Julian Assange asylum application later today. 10:29am. Keep an eye on this reporter. 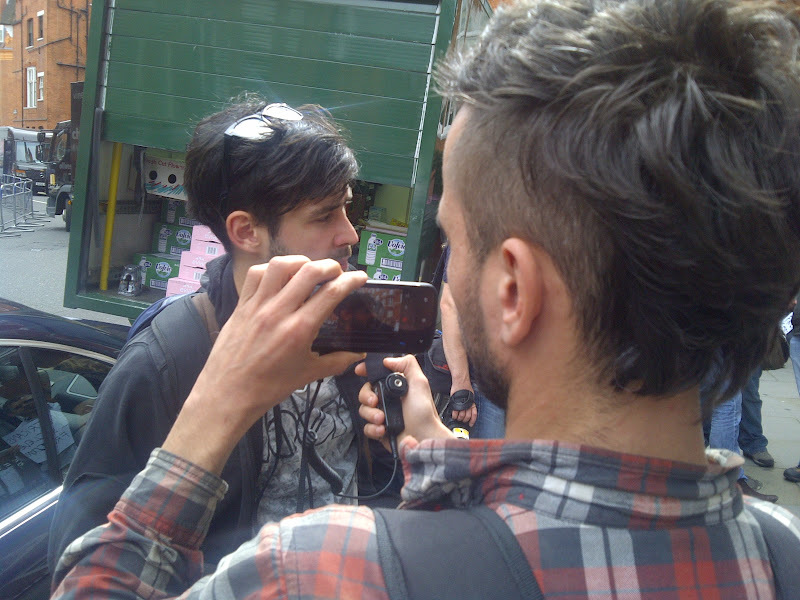 He is holding a camera with a video feed to Ustream. In a few minutes he will be one of the first people arrested by police outside the embassy. 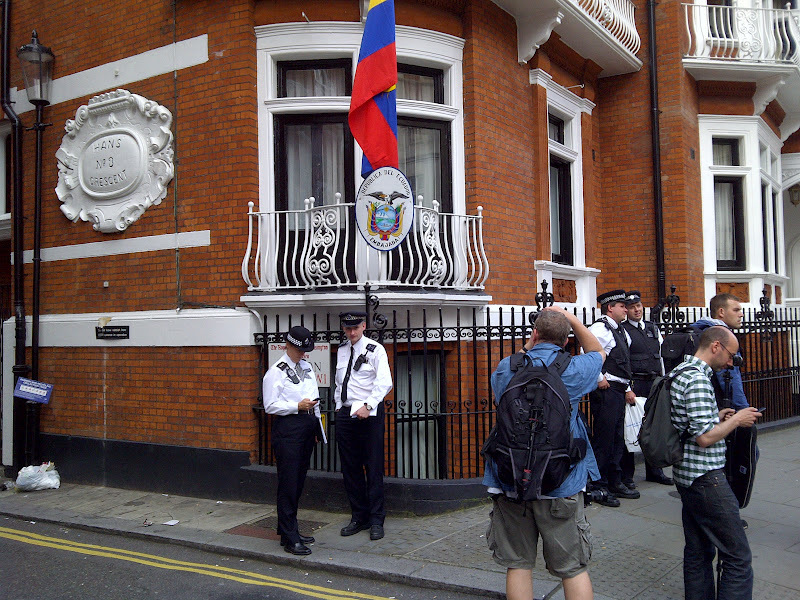 Main entrance of the Ecuador Embassy in London, on Hans Crescent. 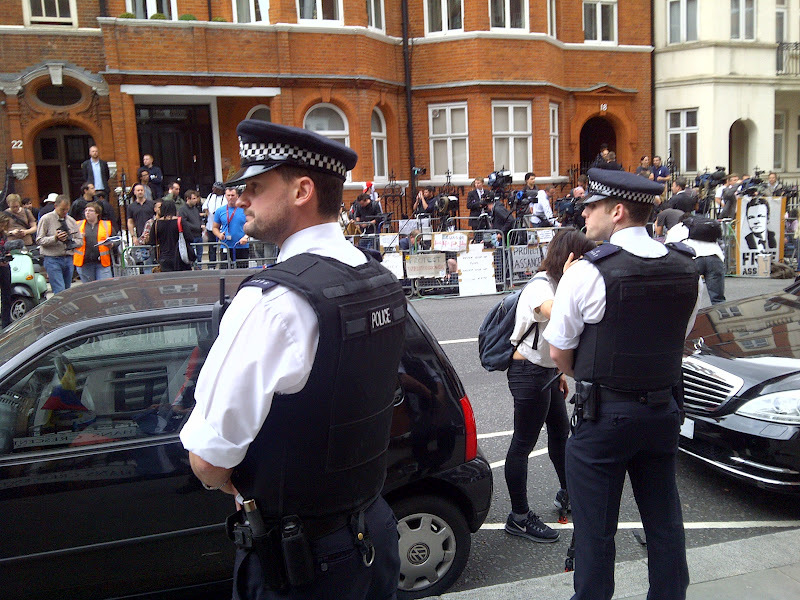 The mood is jovial among the supporters of Julian Assange on the pavement right outside the Ecuador Embassy in London's fashionable neighbourhood of Knightsbridge, only 25 yards from Harrods, the top London department store for the rich and famous. The good mood will not last long. Somebody high above decided that the peaceful supporters had to be removed at any cost, even in front of the world media, based on the opposite side of the road. About 20 police initiated the move into the crowd. Which caused much aggravation and pushing and shoving. It has to be said. What was the point of the move? 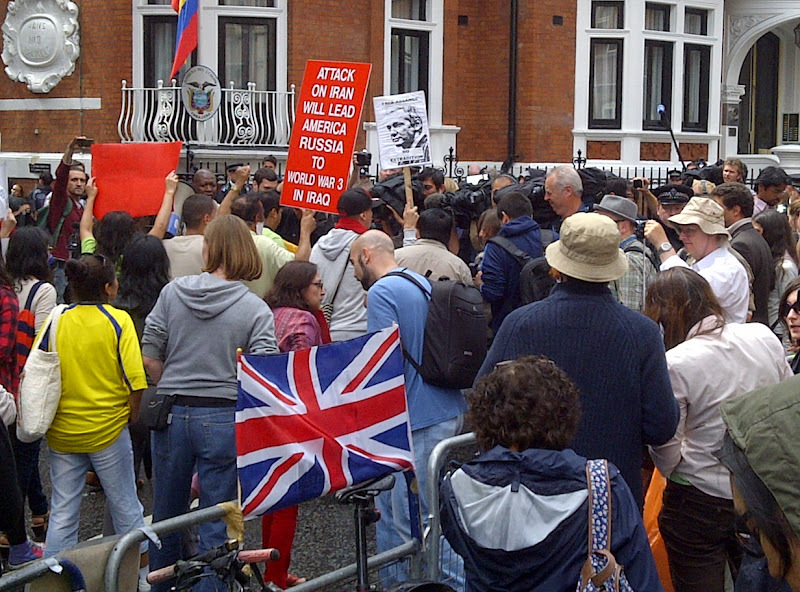 In the eyes of onlookers it seemed like a very clear message to Embassy officials and even President Rafael Correa back in Quito: the British authorities mean business. 10:46:48". 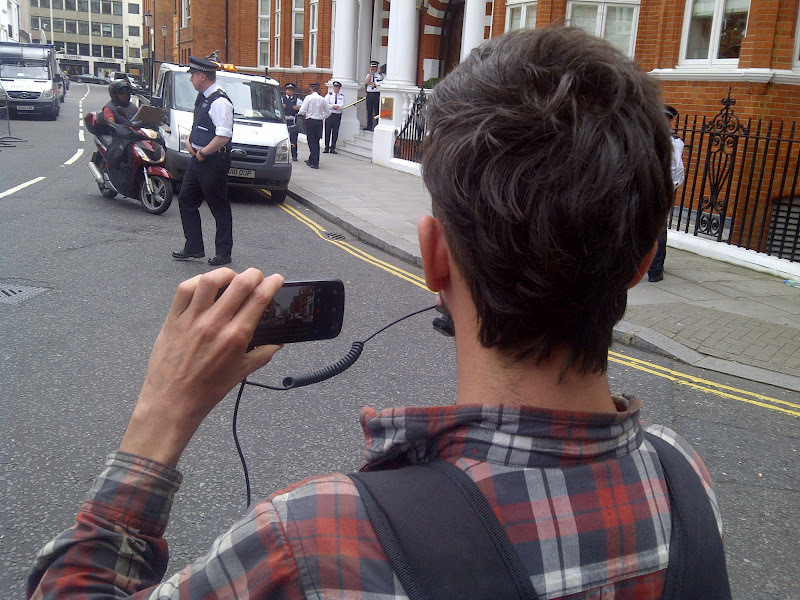 All the better, it seems, if the cameras are there to record the spectacle of violently making a point. The police, that is. 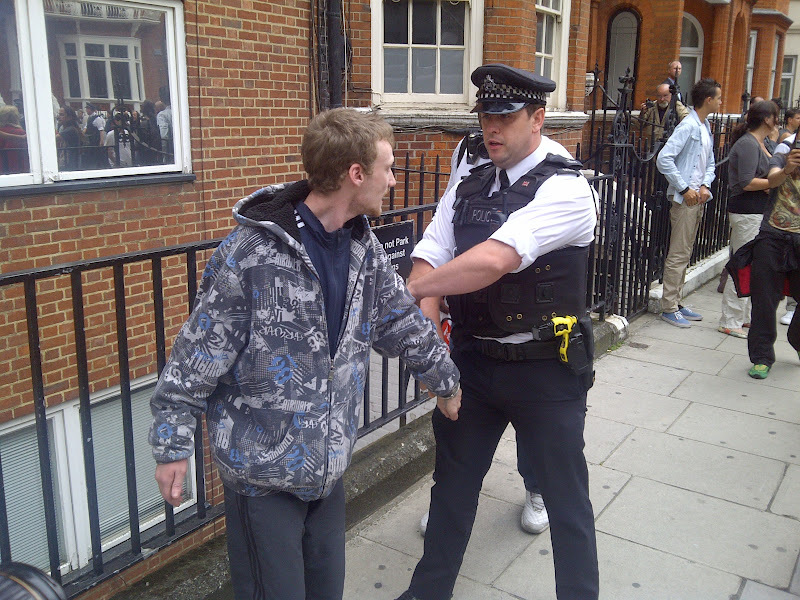 "I saw this kind police tactic employed before in Central London", a supporter said. "Police provokes the crowd with excuses like 'breach of the peace' and 'causing an obstruction'". 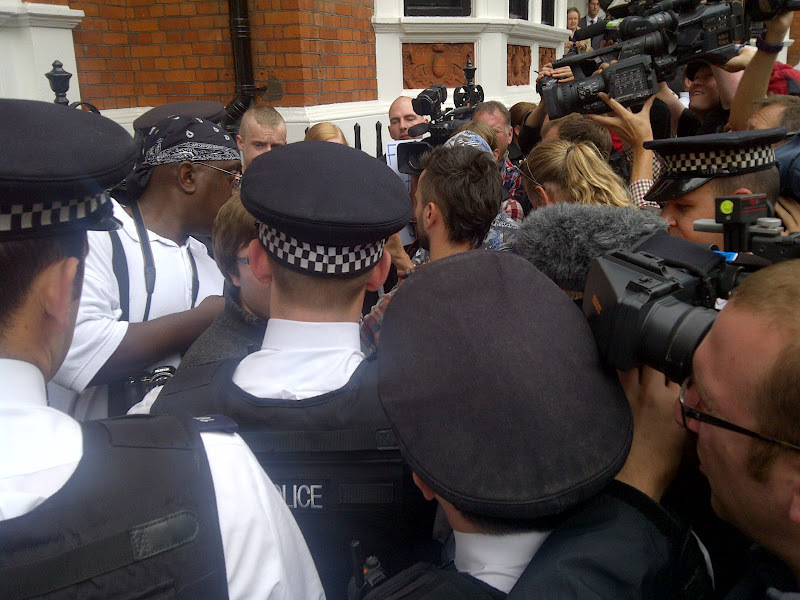 Altercations between police and demonstrators at the embassy follow suit. 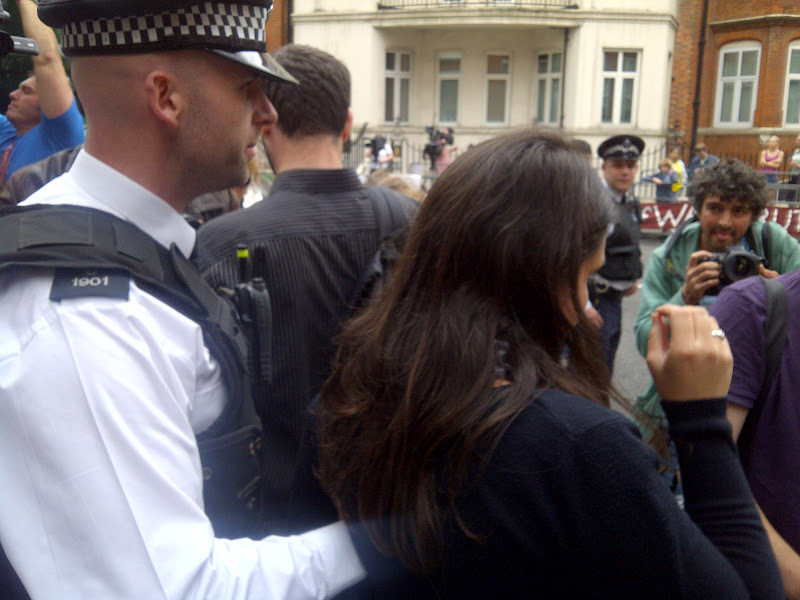 There is pushing and shoving which gives an excuse to police officers to start making the arrests that break-up the demo, which was their objective in the first place. "How long can democracy go on like this?" said the same supporter moments later. The supporter has a point. Authorities in London seem to believe that there is only one way to see things: the Government way. Dissidence and protest is not tolerated beyond a few minutes. 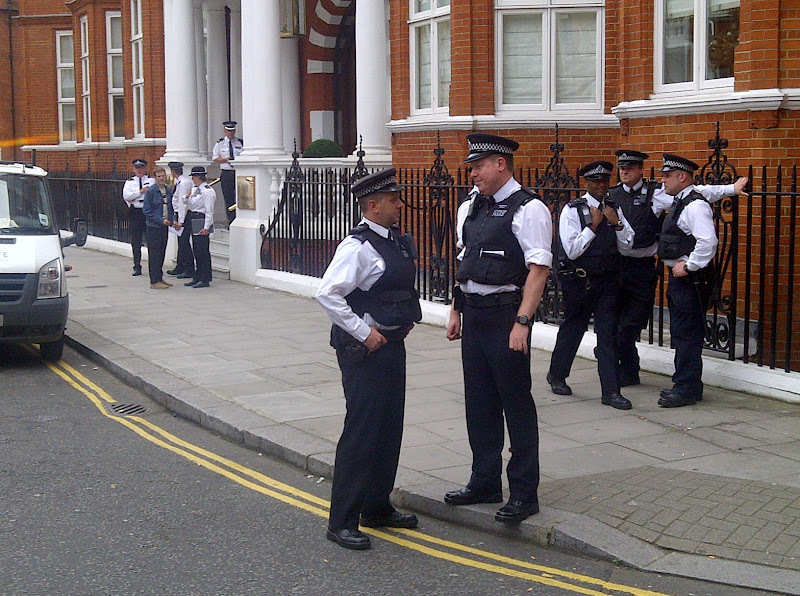 Shortly after assembling at any street in London, police will move in to break up the demonstration. 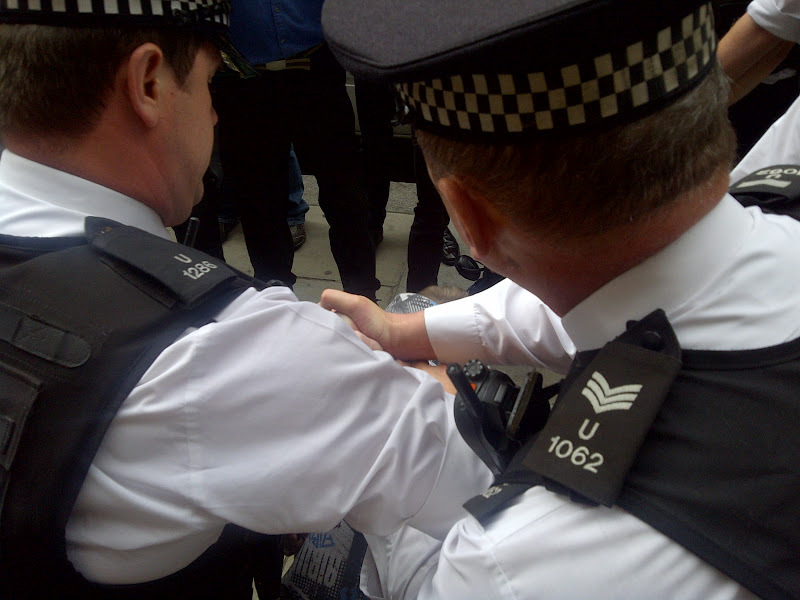 Government and police authorities do not want damaging long term demonstrations like Occupy London Stock Exchange and the Peace Camp outside Parliament, even though they may be necessary. First indications of the new zero tolerance started with the royal wedding last year and continued with the Queen's Jubilee and the Olympics this year. In all these events demonstrations were banned within a large perimeter that the police and the government decided upon. Hugely undemocratic but nobody seems to bother, except the dissidents. Pushing and shoving continued for a few minutes. 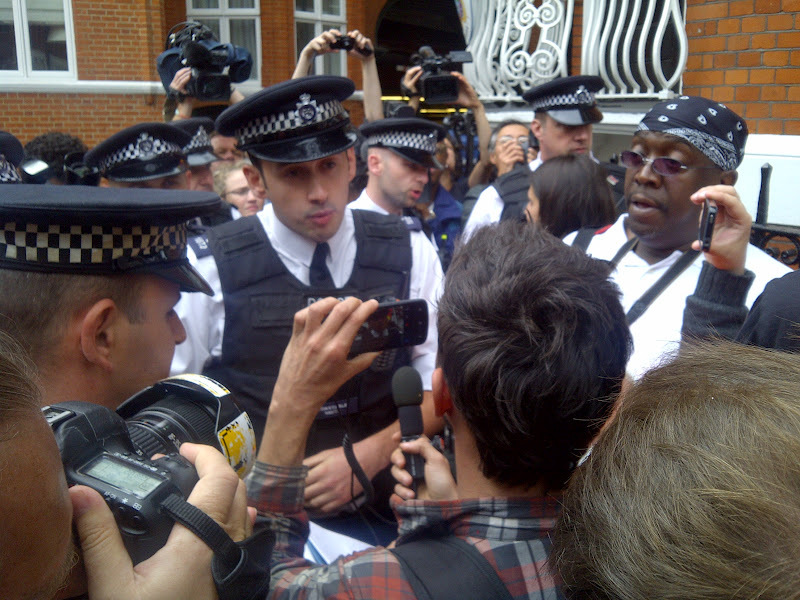 Police officers were singling out the leaders of the demonstration. The supporters resisted the bullying. Scenes of violence and brutality were seen by everybody. 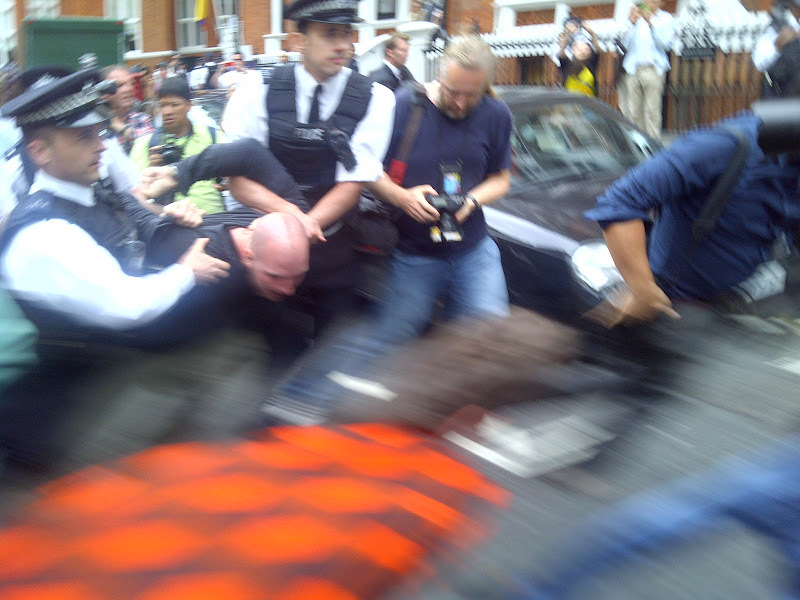 In the pushing and shoving to arrest, London police ran over two world media cameraman, one broke his expensive video camera. Unnecessary. Shouts of "police brutality" rang out. 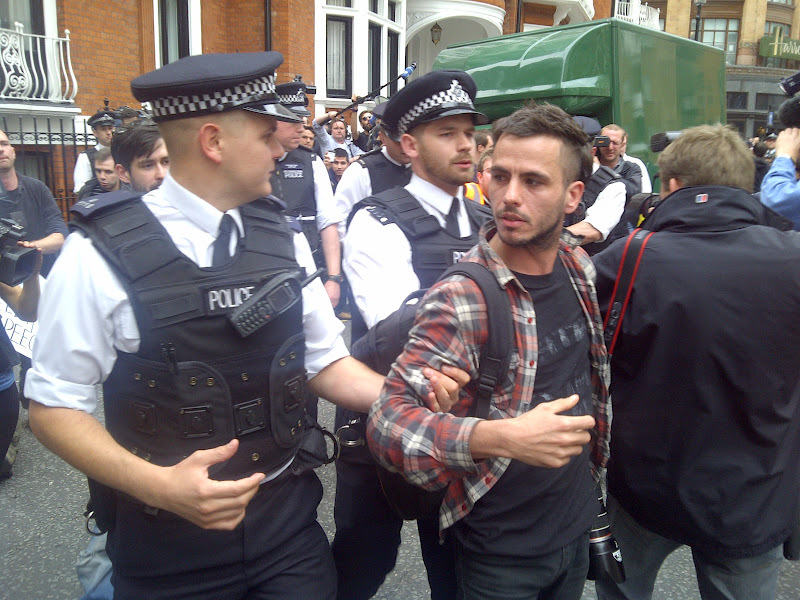 Ecuador supporters were treated as if they were terrotists from a sworn enemy of the United Kingdom Ecuador is a friendly country not involved in any acts of terrorist activity. 10:49am. Have you seen this man before? Yes, we pointed him out to you at 10:29am. 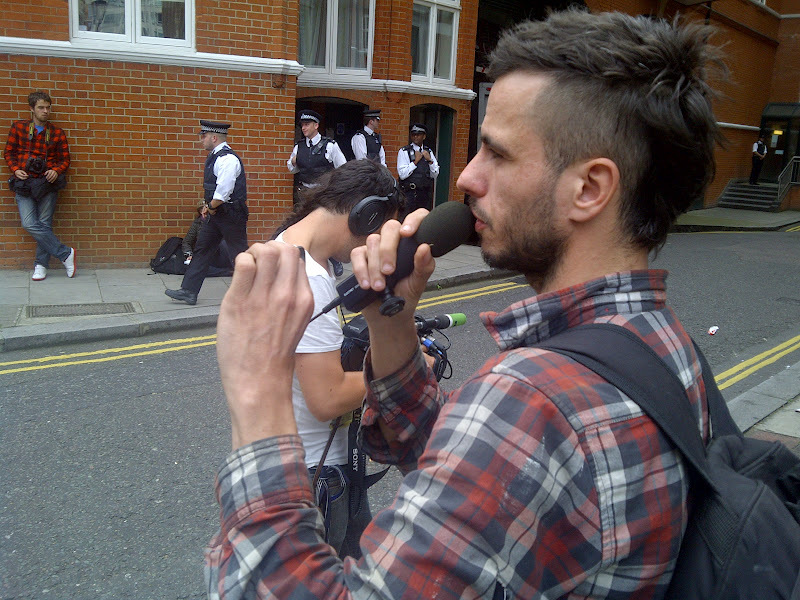 He's the cameraman of the Ustream live feed (now off the air for reasons unknown) for the London Occupy Movement. The point made by the police is very clear. If you are a dissenter you and not welcome in this city. This makes dissenting beyond a few banners a very difficult and dangerous activity in Central London. In a democracy this should not happen. Anybody should be able to dissent and protest. The government should take protest into account. Ecuador very probably have investigated this new trend in British policing. 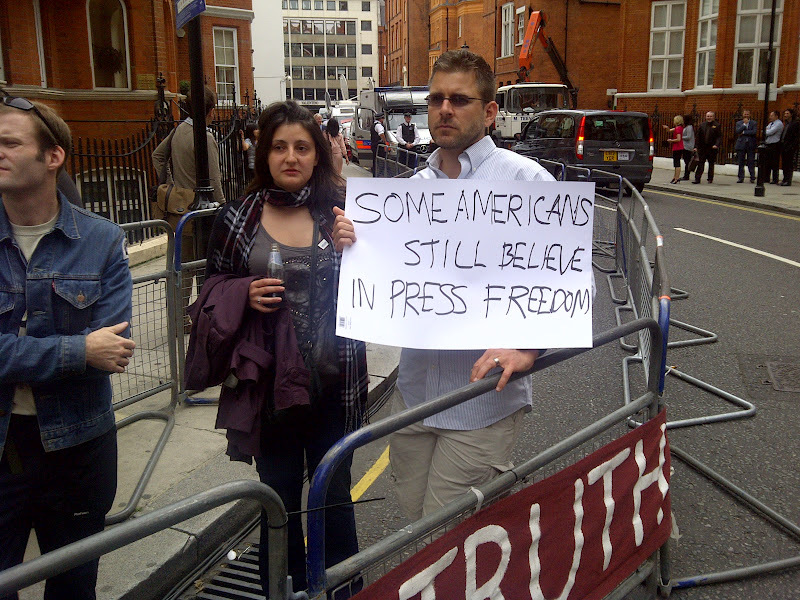 It being proven right in front of their embassy. 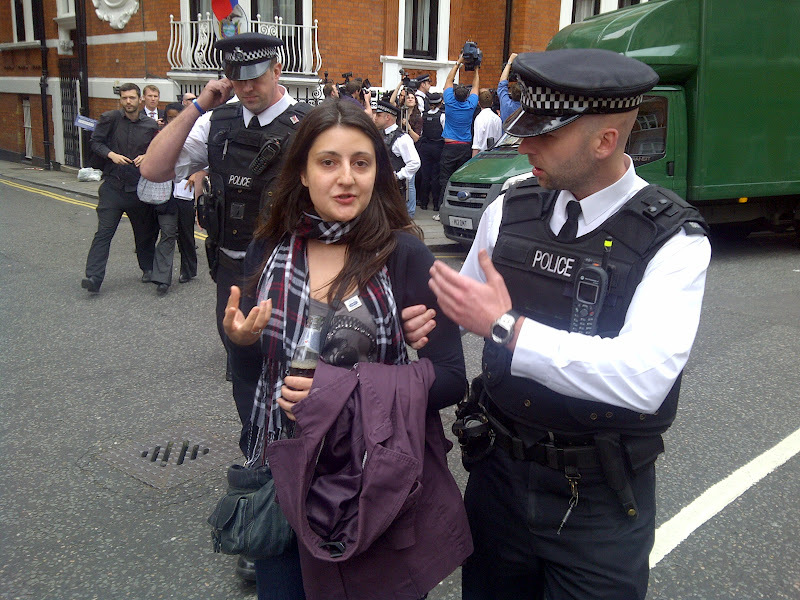 I told the woman Met Police commanding officer at Ecuador Embassy London: "show of force & eviction was unnecessary"
She responded politely: "Thank you for your feedback"
Police arrested me for asking why we should move! Now they keep me confined but "dearrested" with an order that I specifically cannot move! 10:55am. "There is another innocent person down there! Arrest him! 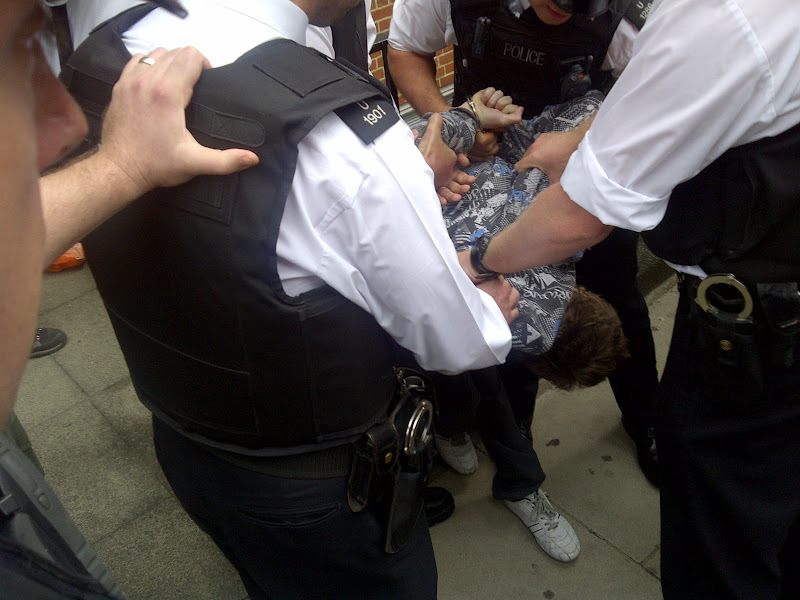 Arrest him!" shouts an Ecuador supporter with the megaphone. 10:58am. 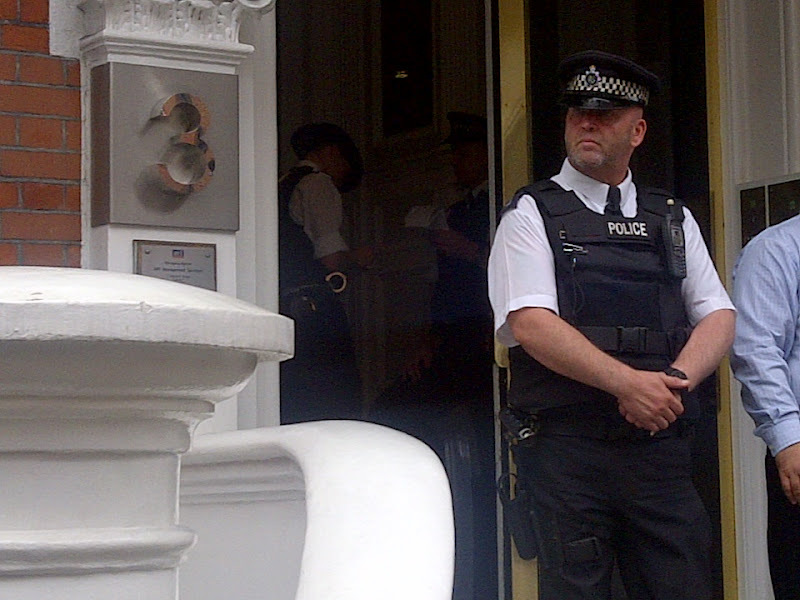 Police now surrounds the premises of Ecuador Embassy in London. They have orders to check anybody coming in or out of the building. 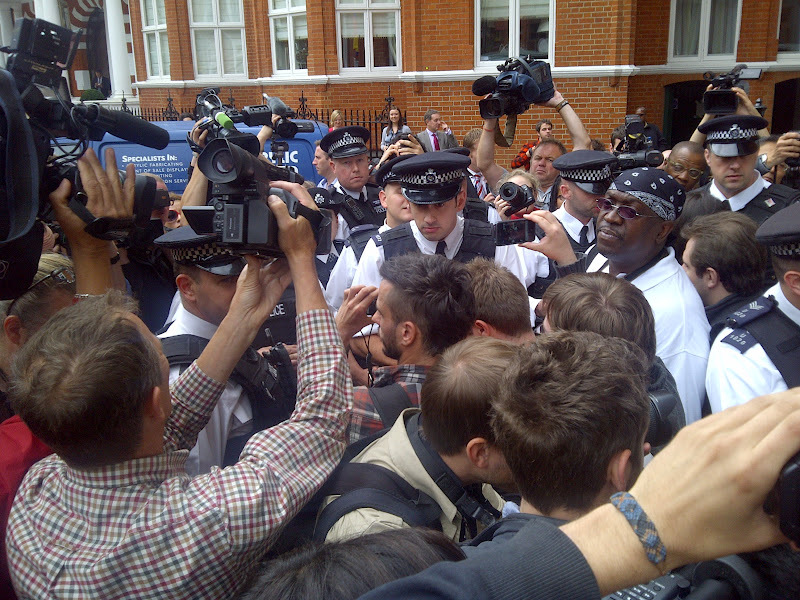 Julian Assange might give them a slip in the melee. Maybe he already has. Arbolioto went for an espresso close to the Ecuador Embassy. It was a lucky move. As I sat at the bar, I had a big flat screen in front of me tuned to Sky News. It so happened that at that very moment Ecuador Foreign Office Minister Ricardo Patiño was starting a momentous press conference in Quito. I twitted almost everything he said. 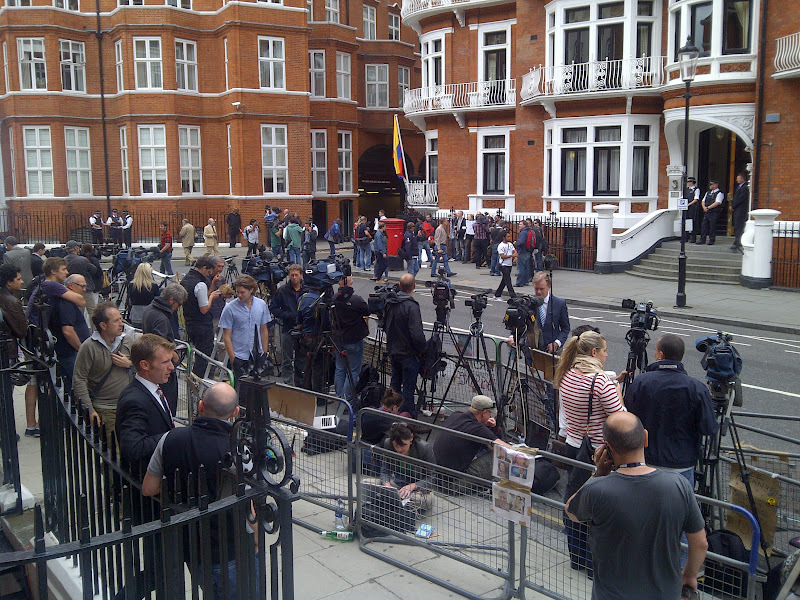 Meanwhile, back at the Embassy, the media and supporters crowd trebled in size. A decision must be imminent. 13:00. 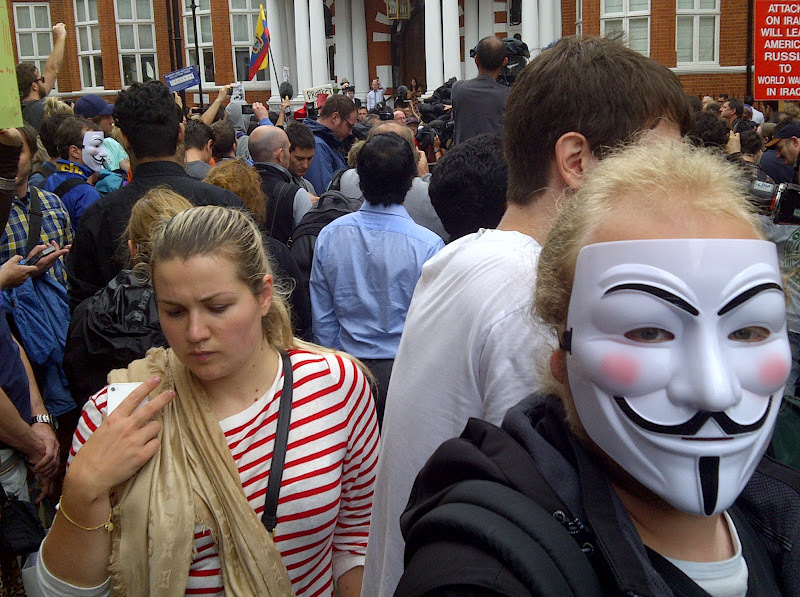 The time for the final decision by Ecuador on the Julian Assange asylum case draws closer. BREAKING. 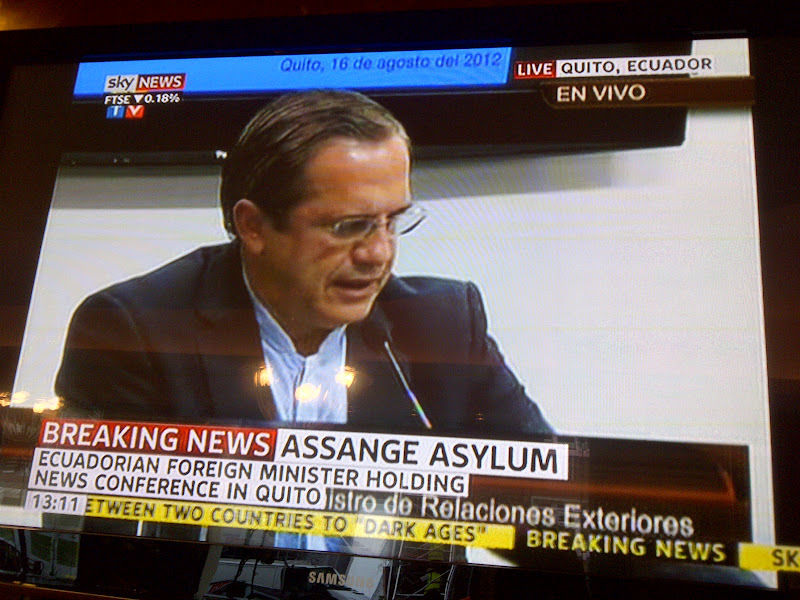 Quito news conference on Assange NOW. 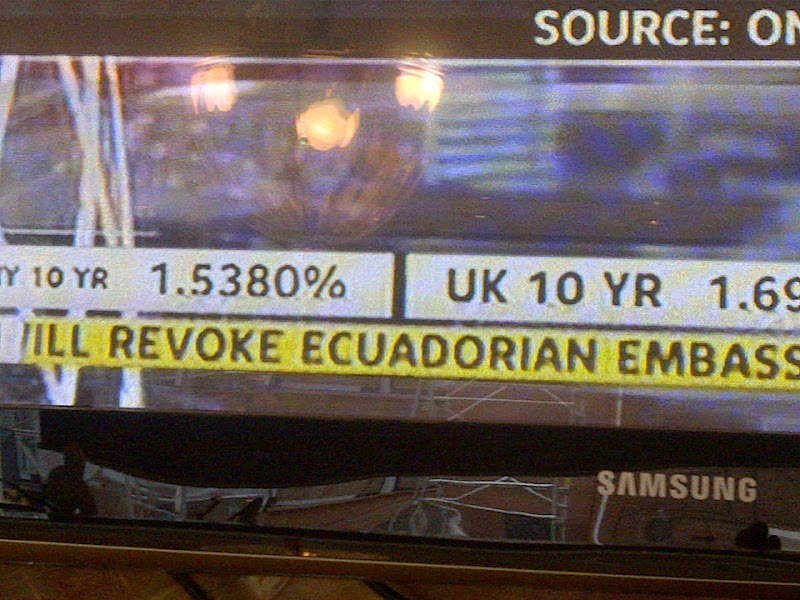 It is clear now that UK Government reference to "revoke Ecuador Embassy diplomatic status" was an own goal and a diplomatic disaster. All embassies around the world were suddenly at the mercy of governments to penetrate their premises without warning, including British ones in unfriendly countries. "#Assange legal rights have been violated" Ricardo Patiño, Ecuador Foreign Ministry in Quito. 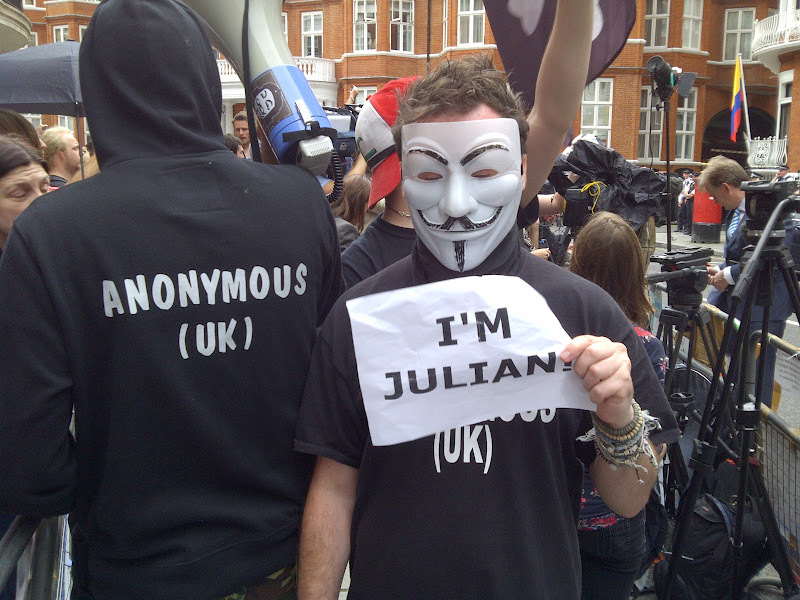 Sky Sources: Ecuador says any arrest of Julian Assange by UK Government would move relations between two countries to "dark ages"
This line of thinking of the Ecuador Government must've been sounding awful in British political circles and great for Julian Assange. It was staging the background for the imminent decision. 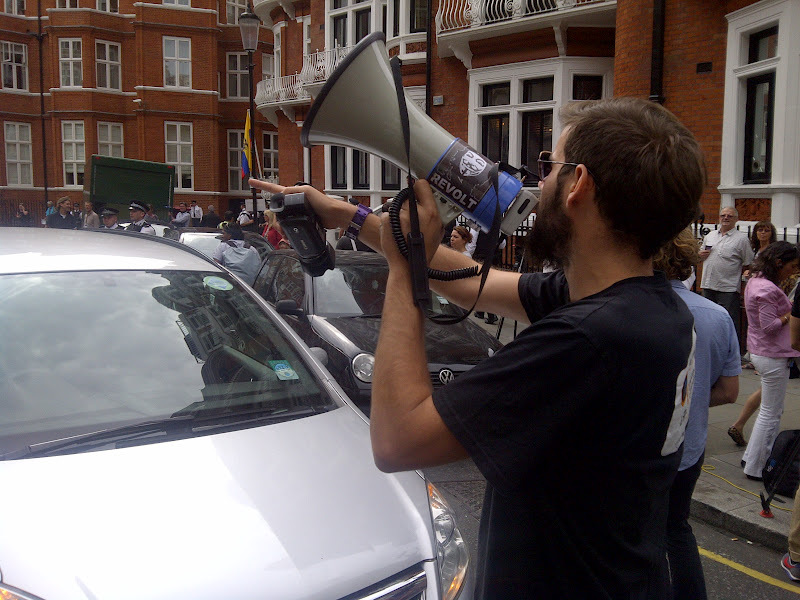 Patiño seemed very pissed off with the threats by the UK Foreign Office about storming the embassy if Ecuador did not comply with the order of handing over Assange. The British Govt macho threat sounded very similar to when Bush and Blair warned the Taliban to hand over Osama bin Laden after 9-11. But there should be some differences in the application of brute force, I presume. William Hague is put in charge of Britain & unleashes greatest ever diplomatic row with huge consequences. Another day at the office. 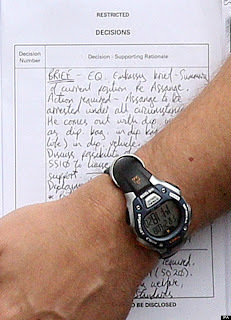 This was a serious 'faux pas' by William Hague his counterpart in the United Kingdom. I heard this last night in BBCNewsnight and I couldn't believe it. Late at night on Thursday August 16th it transpired that Hague is the acting Prime Minister, while both Cameron and Clegg were on holidays. A real shambles for the country. "Relations to Dark Ages if UK storms our embassy in London." Ecuador Foreign Ministry in Quito. Could it be that after 10 years of bombing and war the British Government and the Foreign Office had forgotten everything about diplomacy and would use force as an every day first resort? The threat of storming the embassy was real enough. The whole thing was pionting in the right direction for Julian Assange. 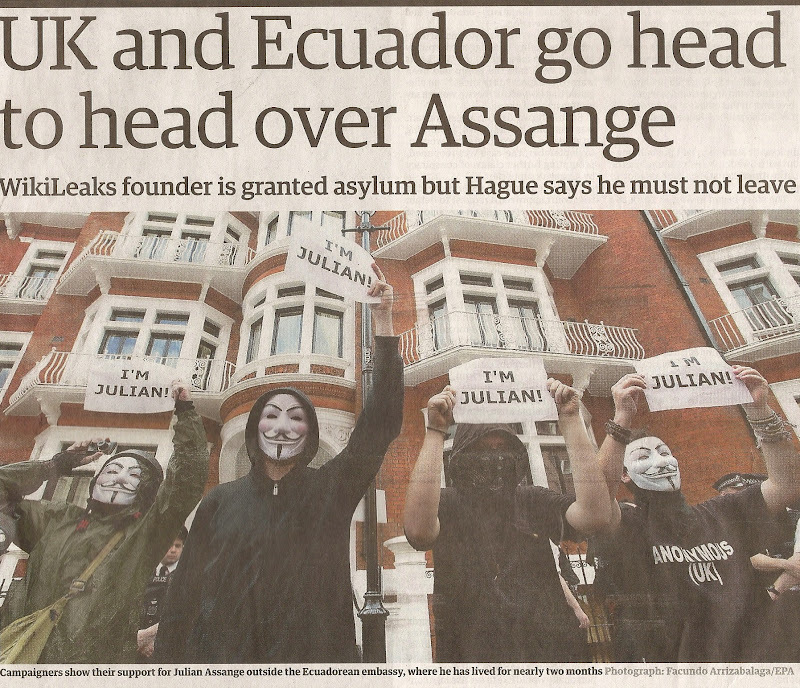 ECUADOR GRANTS ASYLUM TO JULIAN #ASSANGE. Just in case, I repeated the news. 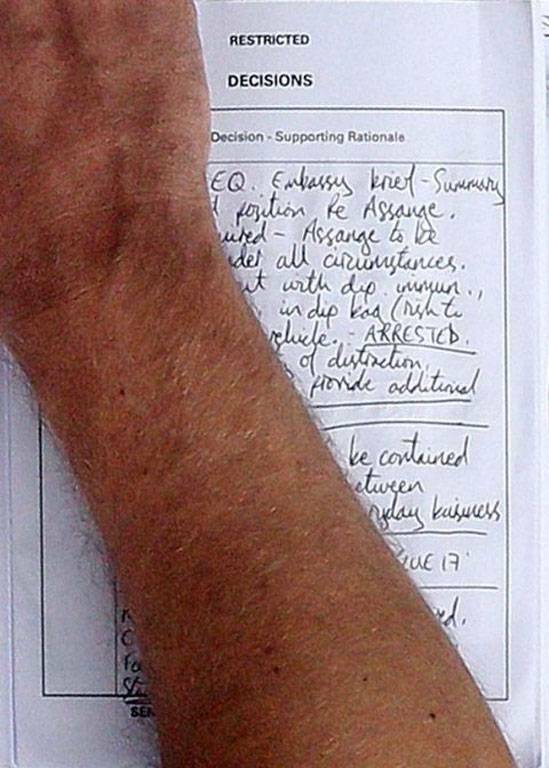 It's official: Ecuador grants asylum to Julian #Assange. Is is pandemonium for UK Foreign policy. 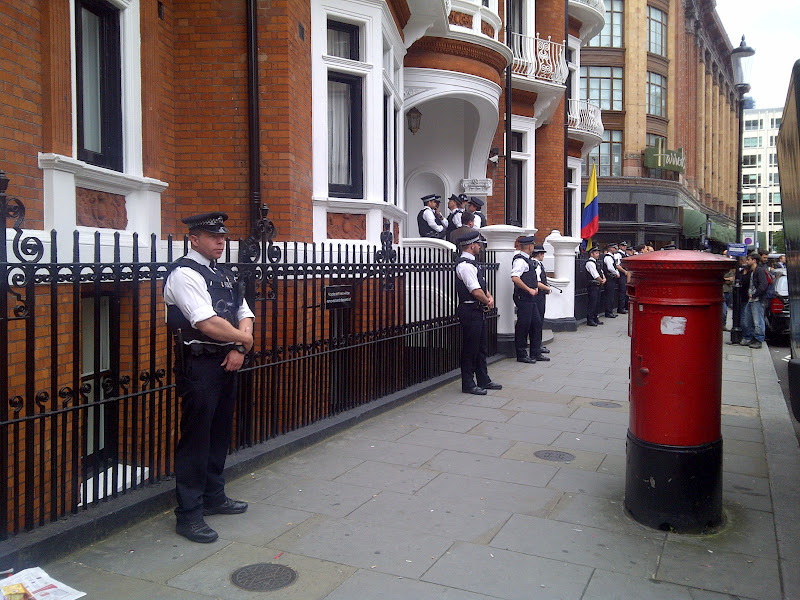 Ecuador Govt tells UK to "back off" on the #Assange issue. 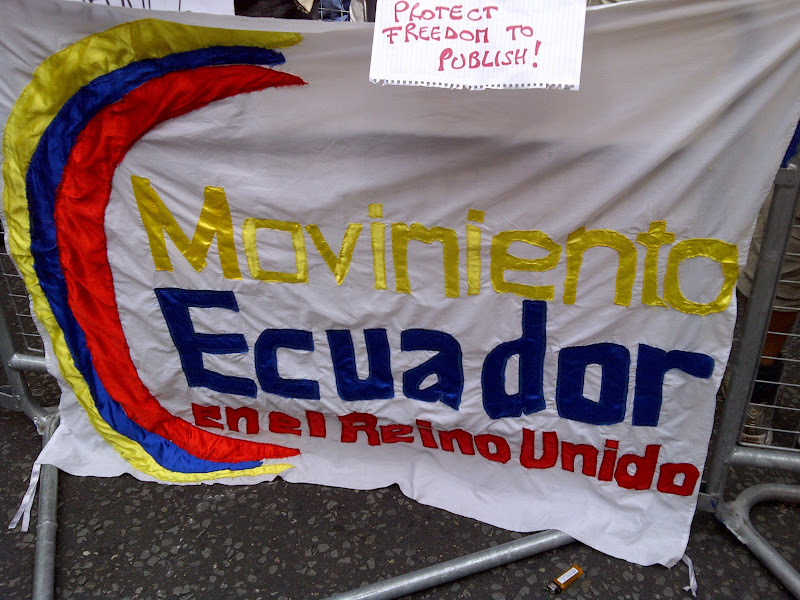 #Ecuador is doing what Australia should have done for its own citizen. What a shame. 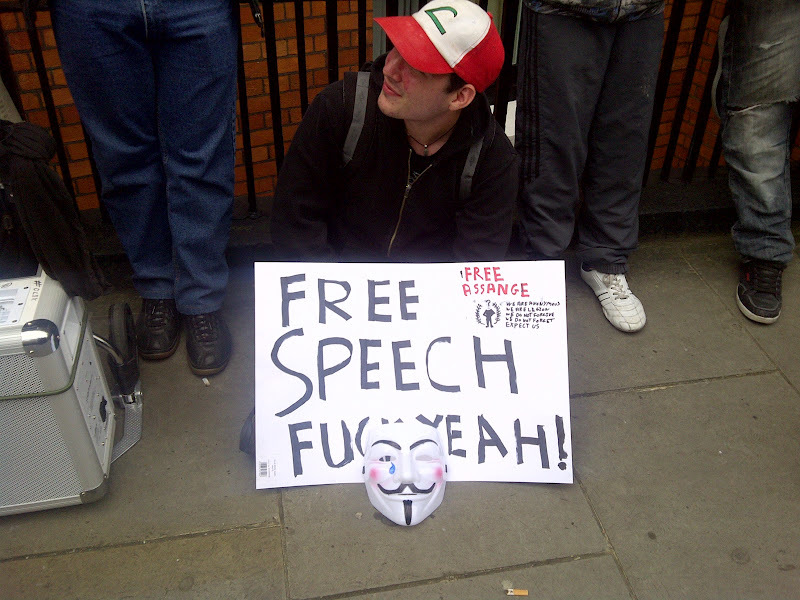 Brave move by Ecuador in defence of freedom of speech! 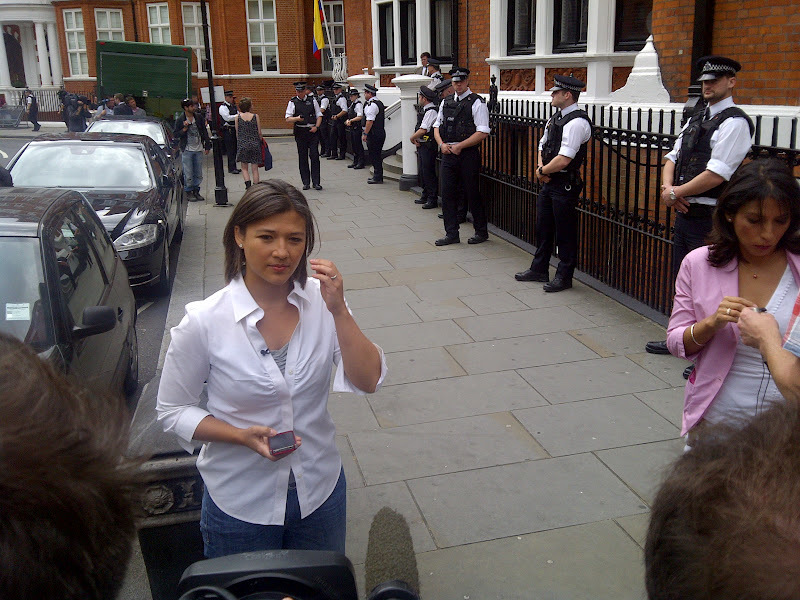 Russia Today reporter at the scene of the action. Japanese reporter makes notes of the huge implications the day has had for world diplomacy or bungling of it by UK Government. 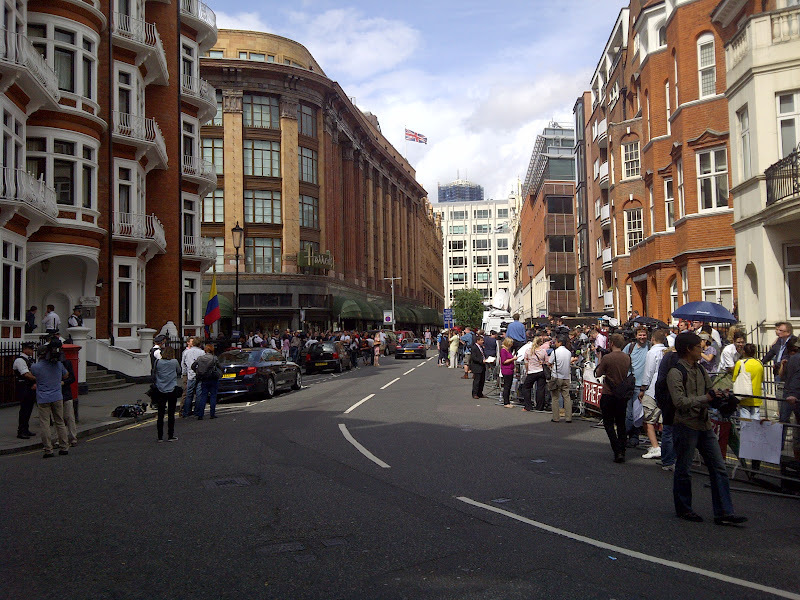 Entrance to Ecuador Embassy is on the left while Harrods is straight ahead. 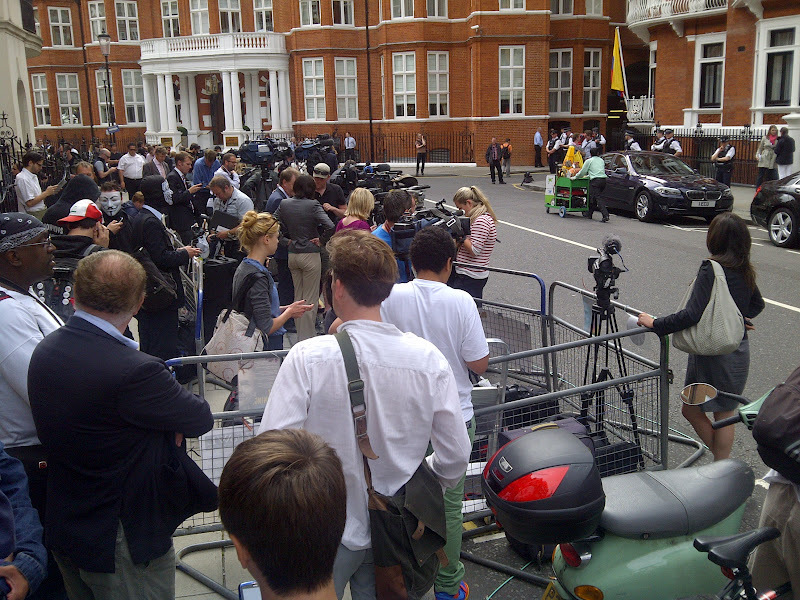 Did Al Fayed -another favourite of British Foreign Office- sent a hamper to Julian Assange? 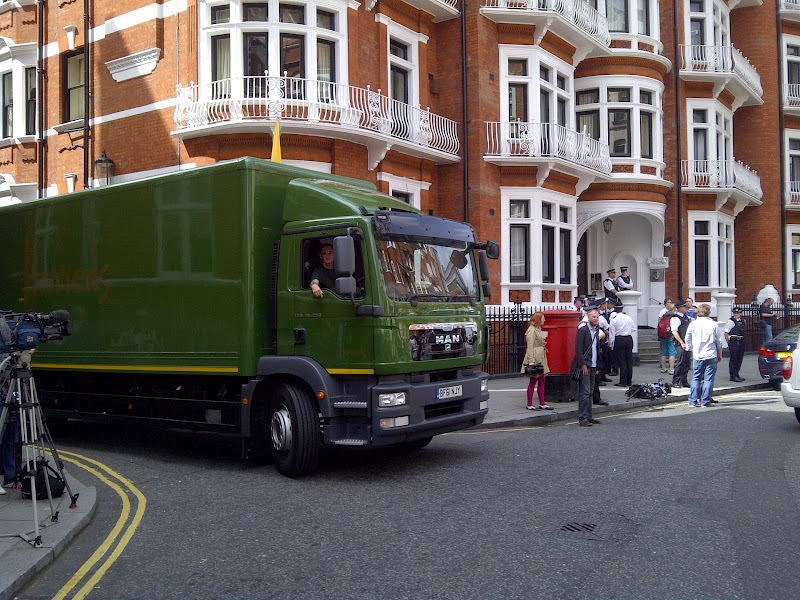 Harrods truck leaves Ecuador Embassy side cul-de-sac. "The First Casualty of War is Truth". In the case of Julian Assange, probably more than ever. Arbolioto photographer ran out of battery during this crucial Anonymous stunt - which won the front pages of many newspapers. It can be seen at the end of this blog. But moments later we managed to capture this one. 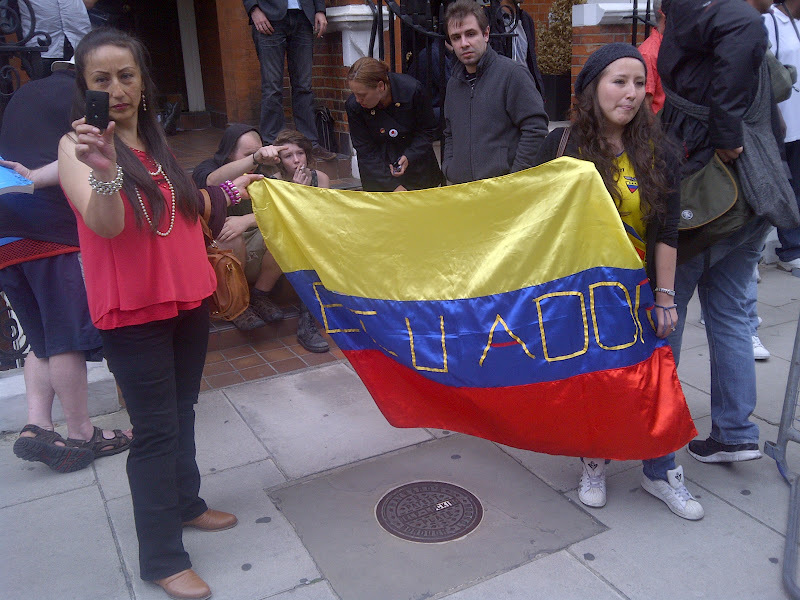 Celebration at Ecuador Embassy for the amazing news. Shock waves around the world too. 13:36. At around this time a couple of crazy tweets by Conservative MP Louise Mensch summarises the mood at UK Government level. No question of "storming an embassy" or "attacking diplomats". There is a question of making sure that building is no longer an embassy. 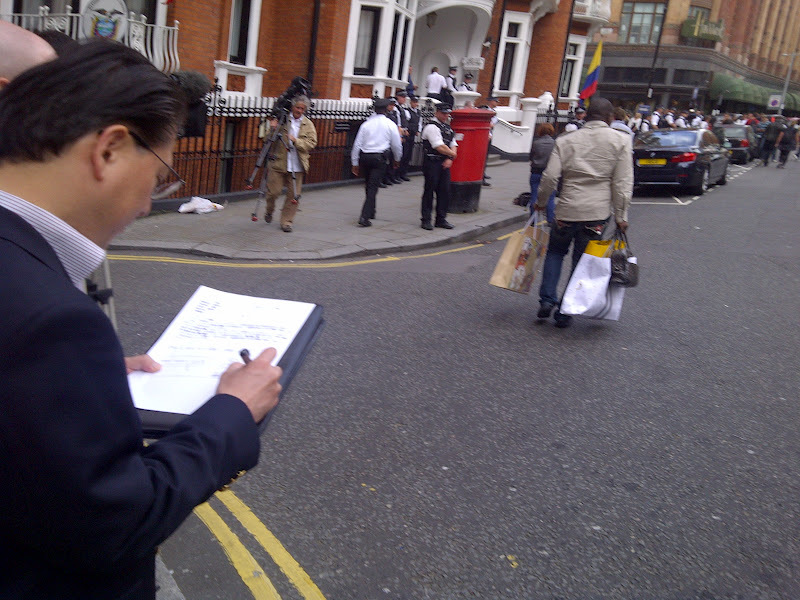 Expel Ecuadorean Ambassador, break off relations, enter former embassy, arrest fugitive, extradite." GONE BONKERS “@LouiseMensch: Expel Ecuadorean Ambassador, break off relations, enter former embassy, arrest fugitive, extradite." 13:42. 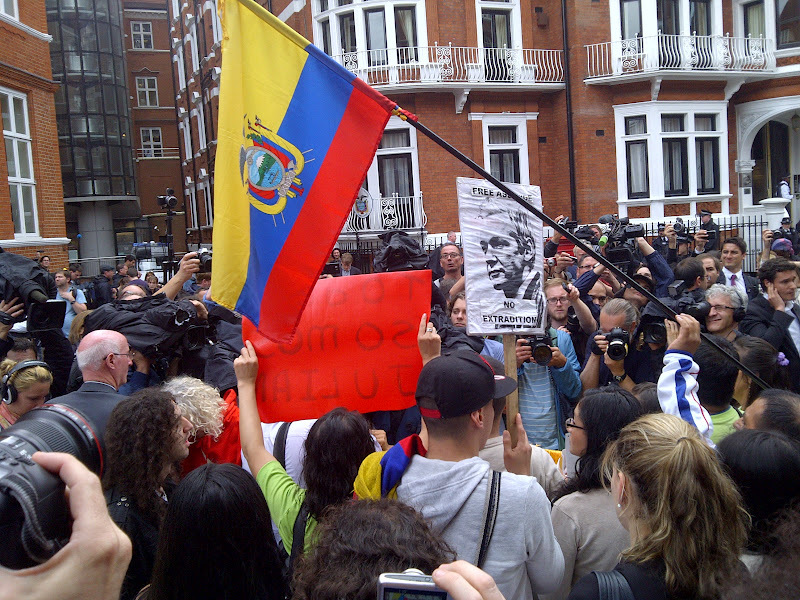 Impromptu demo on the street outside Ecuador Embassy by Ecuadorean nationals and some sympathisers is celebrating the granting of asylum. 14:03. They think it's all over. It is now. 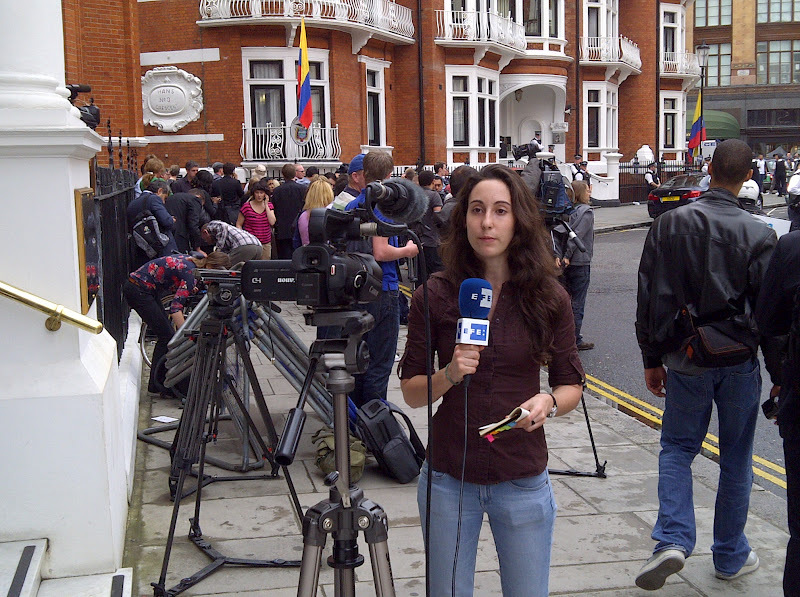 Spanish news agency EFE reporter. 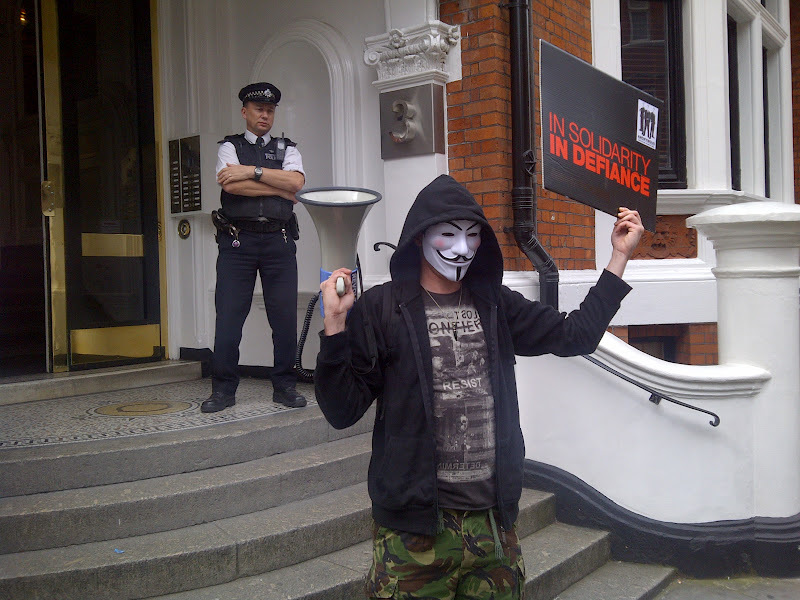 Ecuador Embassy London. 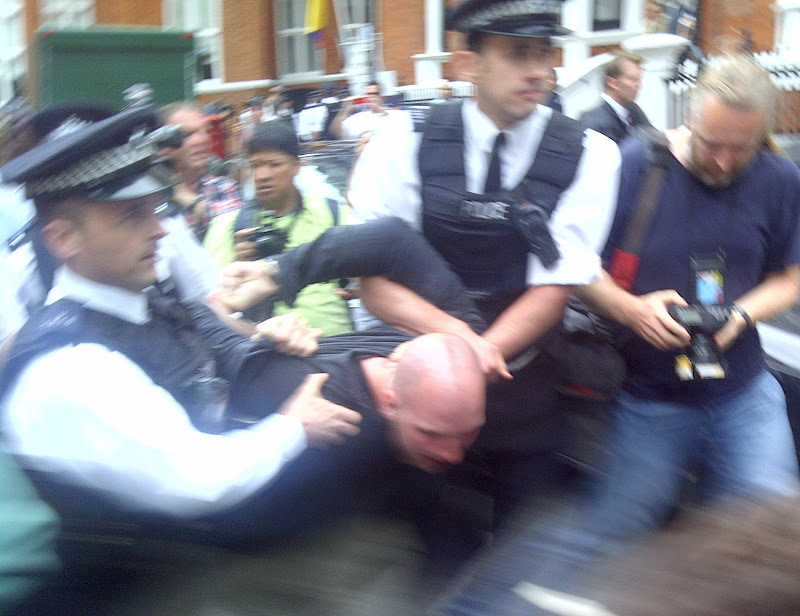 UK police unsure now who the culprit is: British Govt, Ecuador, Correa, Assange, Cameron, Hague, Boris? 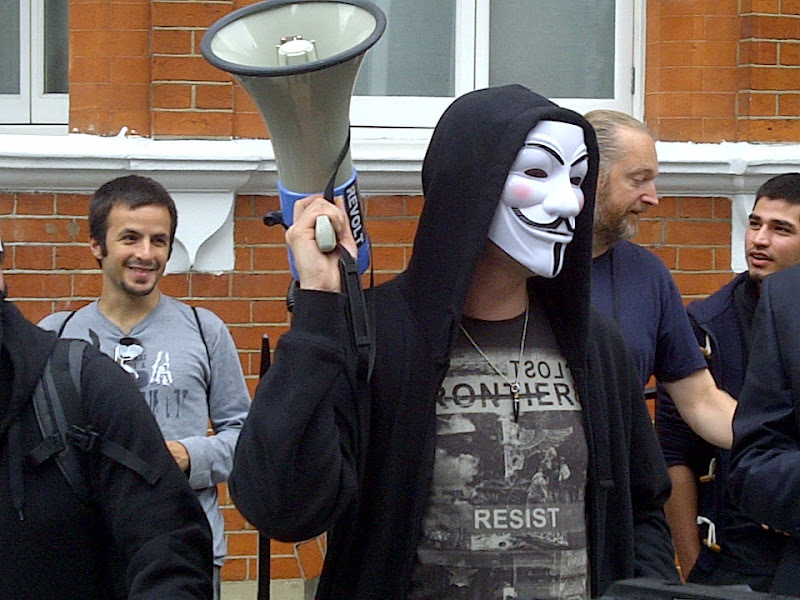 British Govt bully boy tactics has backfired on Assange asylum. What step next: storm Embassy with SAS? On the same day, Vaughan Smith a journalist and chairman of the Frontline Club, a journalist's club, gave an interview to BBC Newsnight. 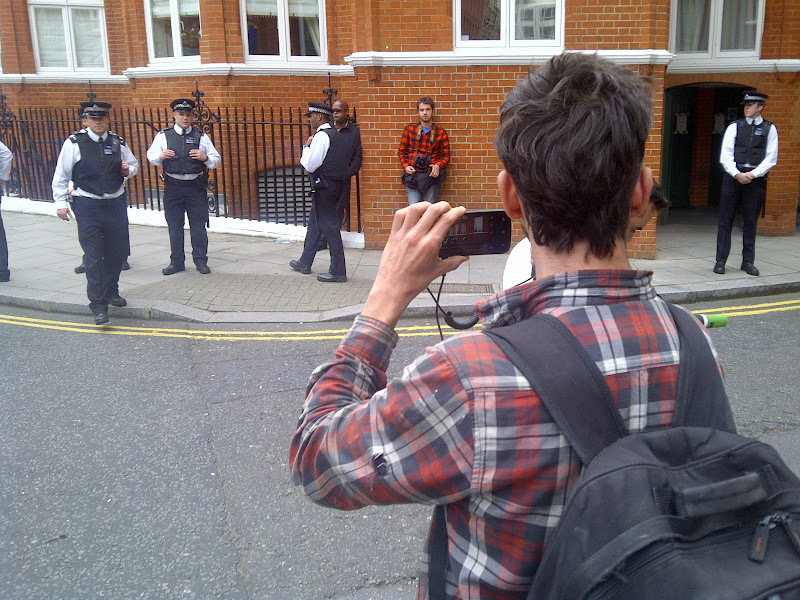 Mr Smith knows Julian Assange well. 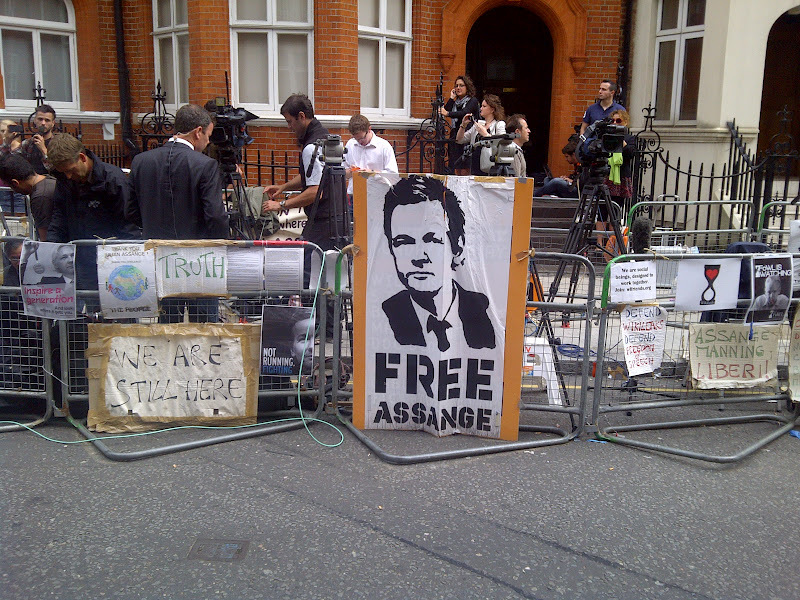 Assange stayed in his house for more than a year while the legal team prepared the many appeals against his extradition to Sweden. I tweeted some of his main points of last night. 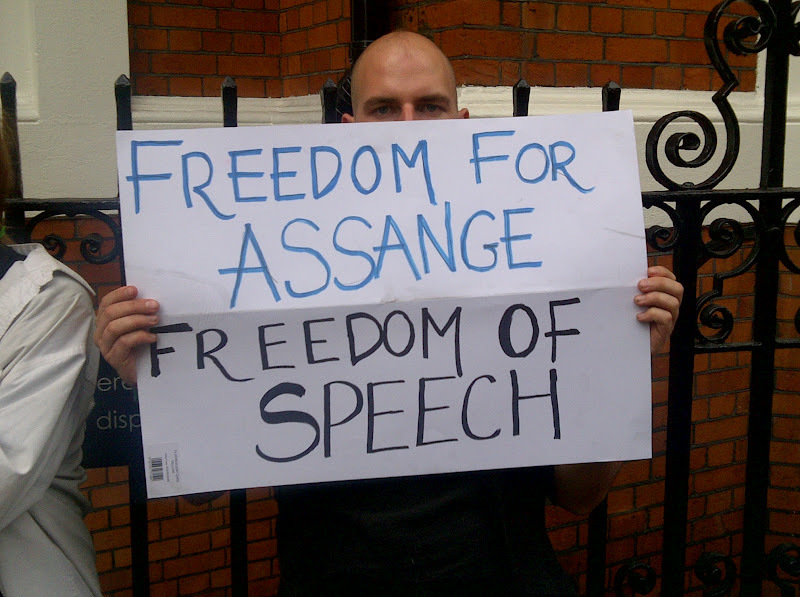 Vaughan Smith on Julian Assange. The next day hundreds of newspapers around the world would carry this picture on their front pages. Front page, The Guardian. Friday Aug 17 2012. 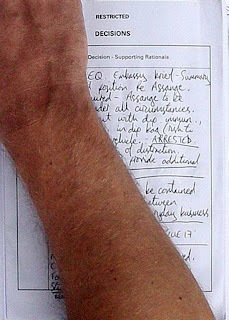 Assange and Ecuador had won this round by technical knock-out, leaving the British Foreign Office embarrassed about their threatening letter. 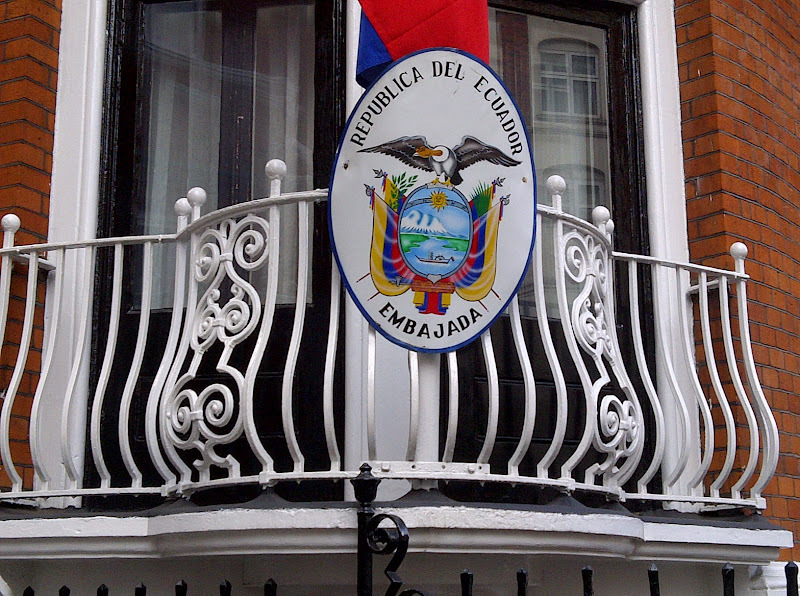 In the following days, several Latin American countries would express support for the Ecuador decision, reminding Britain of the "inviolability" of embassy premises. 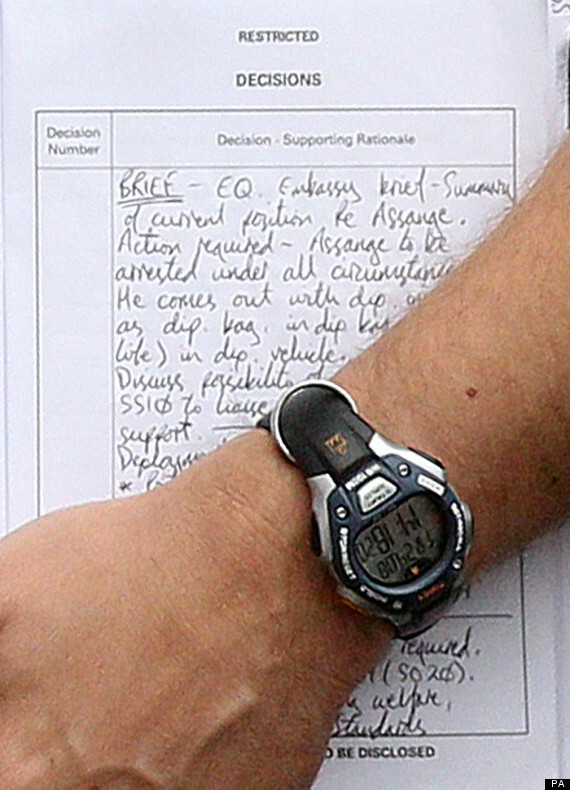 William Hague, the British Foreign Minister, disappeared from the public eye for several days. He was singled out as the principal architect of the British diplomacy disastrous position. Ecuador president, Rafael Correa, and Ricardo Patiño, his foreign minister, came out from the stand-off with their worldwide reputations enhanced. But the battle is on-going. All pictures by Arbolioto Twitter & Blog shot with BlackBerry 9780 mobile phone. Most of them were tweeted on the day.